Photo courtesy of my friend Dave from Your First Visit. Today we are talking about our ideal Disney resort meal. 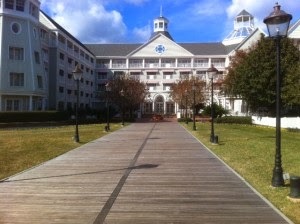 I am going to veer off of the beaten path for my choice, I would choose in room dining at the Yacht Club. We stay there during our last Walt Disney World Vacation and decided to try it out. We liked it so much we did it again a couple of nights later! The waiter comes in and puts a table cloth on the in room table and sets it just like inside the restaurant with the silverware, water glass and cloth napkins. They really paid a lot of attention to detail. It was a completely wonderful dining experience. I definitely recommend it. I would choose to have the Market Greens Salad for the appetizer, followed by the Filet Mignon (medium well) with baked potato for the entree. To finish up the meal I would have the Chocolate Hazelnut Cake. This cake was so delicious, it just melts in your mouth. The absolute perfect ending to a delicious meal!! That sounds like a lovely meal! We really enjoyed it, and it was a nice way to relax after a long day in the parks. Nice twist. I have never had in room dining at Disney. We had never tried it until out last trip. I was pleasantly surprised!! Donna, I've never had in room dining! It sounds like a wonderfully romantic way to spend the night with your significant other -- I'll keep it in mind for Cindy one day! It would be a great idea for Valentine's Day Mike! I think the steaks have it, for the entree loop favorite today! :) Wow, I wouldn't have thought in room dining would be so lovely as you describe - this was a really interesting & fun post! Tami, the cake was my favorite dessert from our entire stay. It's not on the regular menu, you just have to luck out and be there when it is the chef's dessert choice. Filet Mignon in your room....sounds good to me. What a great idea. It was a really great meal Dawn!! I would definitely do it again. In-Room dining sounds like a wonderfully romantic way to end the evening! Great idea for Valentine's Day at Disney - are you listening husbands?? What a GREAT idea! I've never done in room dining at Disney - but makes sense at Beach Club if you're getting to eat from the restaurants around there! YUM! Well we got wonderful food from The Yachtsman delivered to our room, doesn't get much better than that!! Donna- I think the WDW In-Room Dining always gets short service; it SCREAMS special occasion! Yummy choices!!! I loved the added touch of a waiter bringing it into the room and setting the table, definitely made it feel special!! That sounds awesome! I'd love to try this!! Our last in room dining experience was at the Yacht Club and we did it twice that week too! It was just perfect and exactly what we needed! Oh yum! I'd love to have some of that chocolate hazelnut cake! In room dining is always so much fun. And that dessert sounds amazing!